Thiel: Thomas returns; will he stay a Seahawk? After a futile holdout, Earl Thomas returned to the Seahawks. But will he stay? Thomas may not be able to play well while distracted, much like another Seattle star — Randy Johnson. A blink heavy enough to make noise was audible around the Sound Wednesday, as well as throughout the NFL. Disgruntled FS Earl Thomas was back. He lost his staredown. His Seattle teammates, coaches, fans won back one of game’s greatest defenders. “He made me a better coach,” said defensive coordinator Ken Norton Jr., grinning. “I couldn’t help but go give him a hug. That’s my boy,” said WR Doug Baldwin, also grinning. 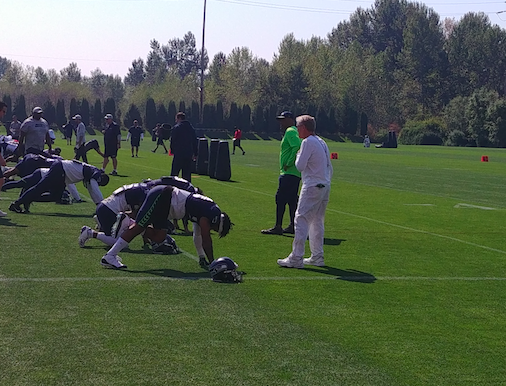 “It’s really good to have him back,” said coach Pete Carroll, who wasn’t particularly grinning. Carroll won the staredown with a hard-line stance that apparently included zero negotiations to extend Thomas’s contract beyond its expiration after this season. Since Thomas, a six-time All-Pro, means just about everything to Carroll’s bedrock defensive principle of denying the long ball, the intransigence was fairly remarkable. But after shedding independent thinkers such as CB Richard Sherman and DE Michael Bennett, and losing to injury stalwarts such as SS Kam Chancellor and Cliff Avril, and dumping the disappointing TE Jimmy Graham, Carroll has relished the transition far more than any Seahawks fan. After the preseason’s third fake game in Minnesota, Carroll offered some thoughts to NBC’s Peter King on the topic that were his most candid yet. “This feels like when you’re in college,” Carroll said. “That senior class graduated — those guys that did all the playing for you. But that doesn’t mean that you can’t have a good team next time around. New players, new coaches. As it applies to Thomas, I think Carroll easily made his peace with life after the potential departure of best safety in the NFL. He doesn’t dislike Thomas, but I think he thoroughly disliked Thomas’s impulsive decision to seek out Cowboys coach Jason Garrett in December with his “come get me” remark after a win over Dallas. And Carroll certainly is not eager to cripple the future with another third contract that can backfire via injury, as happened with Chancellor and Bennett. With the right offer this week, or shortly thereafter, I think Carroll would trade Thomas and take his chances with starting sophomore Tedric Thompson at free safety with the thrill of coaching him up. But that answer wasn’t a “no,” and sounded and felt more metaphorical than strategic. A tweet Wednesday by ESPN’s Adam Schefter said that in the past week the Cowboys improved their offer to Seattle for Thomas to a second-round pick. Within the past week, Dallas upped its offer to the Seahawks for Pro Bowl safety Earl Thomas to a second-round pick, per sources. Seattle wasn’t interested; it wants more. The week prior to the opener is always the highest pressure point in each team’s seasonal set-up. They know better what they need, and are willing to sacrifice to get it. That’s what Seattle, desperate for a pass rush after the injury absence of top rookie draftee Malik McDowell, did a year ago when they traded WR Jermaine Kearse and a draft pick to the Jets for DT Sheldon Richardson. He was good, but turned into a one-and-done, and Carroll lost the gamble. If they keep him, Carroll is counting on Thomas’s legendary focus and competitive intensity to keep him from drifting. That is certainly plausible. But Thomas sometimes reminds me of another extraordinary Seattle athlete with mercurial, filter-free tendencies — Mariners ace pitcher Randy Johnson. Twenty years ago, after Johnson’s desire for a long-term extension was denied by club ownership, he went into a performance spiral (9-10 record, 4.33 ERA) that even he couldn’t understand. No one who knew Johnson believed him to be a quitter, but he couldn’t concentrate after believing he was disrespected by the club. The Mariners traded Johnson in July to Houston, where he went on a second-half tear to push the Astros into the playoffs. That’s about the same approach Johnson took, winning four Cy Young awards over his next 11 years. The analogy is a rough one, because the sports are vastly different. But the risk-reward on the business end is similar: Do the Seahawks think Thomas can play at a premier level after being distracted by perceived disrespect? Players and coaches would like to think he can, and Thomas is certainly incentivized in his contract year to perform well to assure giant compensation. But Thomas has never been here before, playing conflicted. And the Seahawks have a coach eager to move on and teach, not play therapist for a disgruntled star in his final contract year. Ask Sherman. IMO the recent Bears/Raiders trade involving Kalil Mack works against Earl. The Seahawks are going to want a first round draft pick in some way. That’s the standard that’s now been set. Unless someone is willing to do that, and it could very well be the Cowboys if anyone recalls the Joey Galloway trade that Jerry Jones agreed to, Earl will have to play out the year and enter free agency. Wouldn’t it have been easier just to ask for a trade Earl? Thomas did ask for and attempt to force a trade. Problem here lies in that Thomas effectively wants twice what ANY other safety will get paid in a new contract this year. No player is worth twice the top value of other free agents, not even Thomas. IMO he’s attempting to force a trade by pricing himself out of the Hawks comfort level. He probably has concerns that if he hasn’t been traded by the end of the season he’ll be franchised. I think Carroll wants Earl to be here as long as he is. He is the bedrock piece to all that Pete wants to do on defense, and he does not take that lightly. Earl may be replaceable but he cannot be replicated, and while Pete may have been prepared to do his best without Thomas at the back end of the defense, he wasn’t excited about it and he is not going to let him walk without getting a large ransom in return. There is no doubt in my mind that unless the Seahawks get a remarkable offer for him, they will use the franchise tag on him each for each of Earl’s remaining top-of-his-game years. Good points, and I totally agree – Pete’s D happens when first you’ve got Earl. I don’t understand why they didn’t renegotiate in his final year, like they’ve done with the other greats. Unless their philosophy has changed based on getting burned. We won’t know if any of this holds water until we see how the season and post season unfold. I’m hoping it will be fun to watch, while we wait! John Schneider said why: he won’t renegotiate 3rd contracts in the same manner that he renegotiated 2nd contracts. He never has – no change in philosophy. Age is a factor here, not now at 29/30 but later at 33/34. If Earl had wanted a 2-year deal (depending on the guarantee), he’d have gotten one, more than likely. But he wants 4 with the Hawks with a huge guarantee, and I don’t blame him for trying. Maybe he’ll take 2 from the Cowboys after this season, but that’s up to him. Pete knows Earl’s value better than anyone. But he knew Sherman’s too, and let him walk. I think Pete is capable of cutting ties. It’s a function of age and costs. The franchise tag is an unwieldy tool that in most cases is a hurt more than a help. Before they made the statement I thought Thomas was gone, now I think they either extend him on Seahawk terms, trade him after playoffs missed, or franchise him next year. I don’t really see the Hawks letting him walk for nothing unless he becomes so toxic, which is possible, that he gets the Sherman / Bennett treatment. I appreciate the Randy Johnson analogy. I’m thinking that Earl is a bit different – he can only play one way – and that’s always giving 150%, totally focused on his job, blindly without caring about anything else. He’s also got a wonderful showcase in which to not only show his wares off to prospective suiters, but to take his frustrations out on his opponents. It’s the element of playing for “his boys”, just like all of the Legion did, when most of those guys are way gone or different guys, that’s what to me will be most in question. It will be interesting to see how he fits in chemistry-wise, and how quickly he befriends and takes the new guys under his wing, cheers them on – and the ultimate show of love for your team – cheering on the offense when they play like he plays. I’ll be looking specifically for his reaction on the first Chris Carson Beast Mode imitation, or Brandon Marshall dragging two defenders into the end zone. I’m excited to see him back and wish him well, no matter what happens. I don’t think what he did was smart. But he’ll always be one of my favorite Seahawks, and football players in general, for that matter. Earl is different, and I’m not sure even he can guarantee he’ll prevail through distraction. Uncharted waters, kinda like Earl all by himself. Will Thomas’ fines be forgiven? Not known. Pete as always refused to say. Typically even agents don’t leak the news. But Earl might blurt. I heard that they forgave the almost 1 million in fines, but take that with a gain of salt considering that it is from sources that choose to break first rather than break right. As the SeaHawks turn. This situation isn’t good for team focus/adjustment only time works to displace any concerns here. However, if Earl plays with his usual effort and skill the secondary will be much improved. I would like to see him extended two years. Earl would want a three-year minimum, so you’re 0-1 as GM. I find fault in the way JS has managed, as a GM, the roster. Instead of a steady add/replace system where the roster is maintained, skill-wise, he seems to get wrapped up in personalities and individual players too much. Not including this years’ draft, as it is too early to judge, it is generally agreed the past 3-4 years’ drafts and trades have been very poor to average, not a way to maintain a high level on the field. The model I suggest he and the staff go to school on is New England – who can even name 5 players on their roster? Other than the top 4 or 5, everyone else is very interchangeable and trades and draft picks are added/subtracted every year. Brady and Gronk seem to be the only ones that are “definite” year to year. So let’s hope the Hawks have a great season, win the division and are the surprise team of the league, yet should we have ever gotten to this point of less-than-stellar expectations? So here we are wrangling with yet another dissatisfied player who also happens to be stellar and for some reason JS can’t pull off a trade. To borrow from Belichik, “do your job” John. You may not be the first to notice that NE has flourished when others have not. It’s a simple formula: Belichick, Brady and cheating. You also may not be the first to notice that Schneider has had several crappy drafts. Art – As much as I love to see NE lose whenever I see them play, come on – cheating? Really? Admittedly they have not been the paragon for running a clean program, but are you saying they have cheated in each of their numerous SB’s? I find that difficult. They beat us fair and square, unfortunately due in part to a very poor play call and Wilson’s not throwing the ball away. But to the point, one cannot argue they they do not have an excellent system of picking up/letting go players to stay at the top of the league. That system is worth emulating. And yes, JS needs to “do his job” personnel-wise. I for one believe in the axiom “what have you done for me lately” when it comes to a team’s success. They have cheated and will not escape the label as long as Brady and Belichick are there. I agree, they run a very efficient program with roles, responsibilities, adaption of schemes, and foresight; That is why they have a dynasty, for better or worse. Falcons safety Keanu Neal tore his ACL last night. Dan Quinn would probably like to have Earl right about now. Seahawks won’t trade Earl to the Cowboys until after the week three game against Dallas. Speaking of ACL tears, my biggest concern with Thomas’ holdout is that he may not be in game ready shape. We have seen a ton of players miss training camp then have hamstring or ACL/MCL tears early in the season due to the rigors of playing at full speed that is not part of their training. I hope this does not become the case here. There is a reason that when the number of practices declined that the number of these injuries increased dramatically. I’m sure Thomas is gone after this season. Honestly, I think this is a sign that he may be around for a 3rd contract.